The Web is amazing. As a kid, I made countless websites for every hobby, organization, and cause I could think of. Animorphs Club, of which I was the only member? Check. My aunt’s small business targeted only to local dentists? Check. My school, church, and Boy Scout troop? Triple-check. While 12 year old me loved being the only person around who knew how to make a website, what about everyone else? In today’s connected world, nearly everyone will need a website at some point — whether for their wedding, portfolio, or even just sharing thoughts on a blog — and it should be dead simple for anyone to create it themselves. I’m thrilled to share that I recently joined the product team at Weebly, a startup that enables just that for more than 30 million users around the world. Weebly empowers anyone to create a beautiful website, online store, or blog just by dragging and dropping elements on the page. It’s as approachable, intuitive, and easy to use as it can get. In the 8 weeks since I’ve started, I’ve heard so many incredible stories of how Weebly makes an impact in the daily lives of our users — whether helping someone start their dream business, teach their students, or promote their nonprofit. Weebly gives them a voice online. I’m looking forward to helping build the future of Weebly and bringing millions of new voices to the Web. After 8 incredible years at Mozilla, the time has come for me to discover new ideas, meet new people, and explore more of what’s out there. There’s no other organization or community quite like Mozilla, and I feel honored and lucky to have called it home for so long. I can’t overstate how much Mozillians have taught and shaped me personally and professionally, and I’m so grateful for our time together. Building cool stuff. It’s been too long since I’ve spent time building and shipping a personal project, and I’ve got some new ideas I’m itching to play with. I’m excited to stretch some creative muscles and see where they take me. Learning new skills. In recent years, my passion for travel has led to a strong interest in learning new languages and becoming a better photographer. I’m looking forward to spending time learning Spanish, photography, and other skills — maybe I’ll even become a Wilderness First Responder! Reflection. Tomorrow I turn 27. It’s a good time to stop and think about the bigger picture – what matters to me, what I truly enjoy doing, and plans for the future. I’m happy to share that I’ve recently changed roles at Mozilla, joining the Labs team to help some of the cool experimental projects there reach their potential. Since its first experiment in 2006 with the Chromatabs extension for Firefox, so many great ideas have come out of Labs over the years, and I’m excited to be a part of the next generation of them. When I first began contributing to Mozilla as a volunteer add-on reviewer, I had no idea I was joining a community I’d call home for so long. Working on AMO and the Firefox Add-ons ecosystem the past 6.5 years has been an amazing experience that I’ll never forget. Leading the add-ons team/product the past couple years and helping lay the foundation of the Firefox Marketplace more recently has been a unique experience in which I’ve met many great people, learned a ton, and had lots of fun. I’m looking forward to what’s sure to be a very exciting year for Mozilla and the web. The best photo of me running that has ever been or will ever be taken. Two weeks ago I flew across the country to run my first half marathon at Walt Disney World. After 6 months of excitement leading up to the race and many weeks of seemingly constant training runs, I crossed the finish line with a better time than expected and felt great doing it. As a big fan of Disney Parks, I knew this was the perfect first race to keep me alert and motivated through 13.1 miles, with entertainment every mile and 2 big milestones to look forward to: running through Magic Kingdom around the halfway point, and finishing at EPCOT. I was a bit nervous in the weeks leading up to the race because of a knee injury, but it turned out to not be a problem at all when race day came. I was really surprised at the end that everything had gone so well, and then I realized that’s what all the training was for. It’s not like I decided to take a shot in the dark and find out if I could run a half; I had already pretty much done it in training. The more impressive thing was waking up at 3am Eastern (earlier than I usually go to bed Pacific time) two mornings in a row for this madness. Speaking of which, the scale of runDisney races is impressive, with 25,000 runners in both the half and full marathon, and an additional 10,000 in the Family 5K (which I also did to run even more in the parks). I’m already registered or hoping to register for a number of other races this year, including the Inaugural Rock ‘n’ Roll SF Half, Bay to Breakers, WIPRO SF Half, Big Sur Half, and of course the Disneyland Half (and inaugural 10K, together making the Dumbo Double Dare). But it’s not all coasting for those, as I have 3 more goals in mind for this year: learn to toe strike, be able to tackle hills without total exhaustion (SF Halves, I’m looking at you), and improve my time. As I ran this half with 1 minute of walking for every 4 or so minutes of running, most of my time improvement will probably come from attempting to run continuously for longer periods of time. Early last year, I decided to try out running after never really having done any athletic activities before in my life. I downloaded a neat Couch to 5K app for my phone and was initially quite successful in going from barely being able to run at all to running several minutes at a time. I lost interest after a bit, and would try to pick it up by going for a single run every couple of months. In May of this year, I decided to try out Bay to Breakers, just to see what would happen. If tens of thousands of drunk people can finish a 12K, why can’t I? Wait, how far is a 12K? Things went well the first 5 miles, but the second half was really rough. I injured my knees and ended up walking most of the last few miles and sitting in excruciating pain for days afterward. I hadn’t trained at all even though it was certainly the farthest I’d ever run. But despite the physical pain, it felt great that I’d set out to cross the finish line and did. I decided I wanted to train for something real that would challenge me both physically and mentally, to see if I could do it: running a half marathon. Too often in the last few years I’ve started projects or goals and haven’t finished them, and having the experience of training for and finishing a half marathon would give me confidence in my ability to follow through, as well as help me get in better shape. 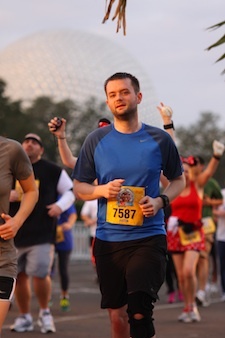 Within a few days, I knew what my target half marathon would be: the Walt Disney World Half Marathon. As a huge fan of Disney parks, it’s the perfect race: an excuse to go to Disney World, lots of Disney entertainment along the course, and lenient pacing requirements. And of course getting to run through the parks, including some backstage areas. Held every January, I’d have plenty of time to get ready. I knew I’d be doing a run/walk program in order to build up the endurance necessary to go 13.1 miles. For this first half, my goal is just to finish, regardless of time. I looked at Jeff Galloway’s training plans on runDisney, but ended up going with the Marathoning for Mortals plans after someone suggested reading the book. I’ll talk more about run/walk training in a separate post. It’s now 2 weeks away from the race and I’m as ready as I’m going to be, and getting really excited about the trip. I feel pretty confident I’ll be able to finish even though the farthest I’ve gone in training is 10 miles. But I’m still starting to get nervous and thinking about what to pack/wear, making sure I don’t get injured before the race, and other miscellaneous preparations. If all goes well, I have several other half marathons lined up next year that I’m excited about, and will give me an opportunity to start working on my speed once I know I can finish.